More raw material from Brattonsville. This is a section of a macro photo of a leaf, backlit in late afternoon. 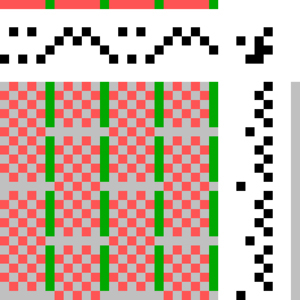 After some editing and indexing to 3 colors, I think I'll add it to the queue for weaving. There is enough left on my lampas warp for at least one or two pieces. Nevertheless here they are for your enjoyment. This is a bedchamber in the farmhouse. The lighting is natural window light. Brattonsville is a restoration of an 18th and 19th century Southern plantation. On our visit this past Monday, we saw these costumed interpreters enjoying an al fresco lunch. The Vest. It was a major project in 1990, yarns and sett finer than any I had previously woven. The construction of the garment was challenging, too – facings, interfacing, underlining, lining, piping, buttonholes – the works. But when I flipped the vest to the right side and tried it on, it was a mess. The lining pulled the outer fabric in unexpected ways. I was absolutely stymied, and undoing and redoing was not an option, as all the seams had been graded and clipped. A sharp pair of scissors to the rescue. I slashed the lining here and there until the outer fabric lay straight, and then with scraps of leftover lining, applied patches with careful handstitching to cover the slash holes. Success! The vest would not win any contests, but it was wearable, and I felt as though I had pulled a rabbit from a hat. I no longer wear the vest, as it doesn't fit my current dimensions, but from time to time I take it from my closet just to admire the lining. This is definitely the fun part. It's like these little pixies have been hiding in the warp and have just allowed themselves to be magically revealed. And there's no doubt in my mind – this is magic. I've always believed that getting imagery into cloth is magic, whether it's tapestry, hand or machine embroidery,cross-stitch on canvas, or jacquard weaving. I am incredibly lucky to have access to this technology. Some forward progress on the portrait weaving. The torsos are now in view. I'm wondering if I've somehow miscalculated the aspect ratio, as their legs are looking kind of long. My hope is that when the tension is released and the piece is steam pressed, everything will fall into place. This was a good day's weaving, around 900 picks. That's a lot for me on the TC-1, as my top speed is 14 ppm, and I get up frequently to walk around, wind bobbins, etc. I think I'll reward myself by going to a baseball game this evening (It's Sunday as I write this). The project I'm working on now on my TC-1 is based on a drawing which is based on a photograph. In Photoshop, I add a layer above the photo, fill it with white, dial the layer down to 50% opacity, and with the pen tool, black ink, I sketch on the photo, loosely following the original. Then I dial the opacity back up to 100%, flatten, threshold, add a third color for the background, put each color on its own layer, add the weaves as layer styles, and send the project to the loom. 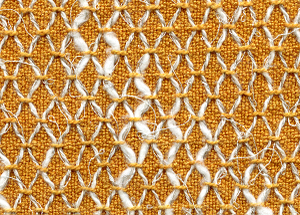 The weave structure is lampas with two pattern wefts and a ground weft, hence the three shuttles, and my aspect ratio for this file is 1.25/1. These are exactly the same yarns and setup I used for the Pirate Ship. It's always fun to see the pictures "grow" on the loom - a bit like watching a print come out of the printer, except in this case it's feet first. First off - for some reason, my last two posts, both dealing with Swedish honeycomb, or "honeycake" weaves, have vanished into a black hole! These are the posts for May 21 and 22. I know they were up on my blog originally, as some of you have seen them. I will continue to pursue this problem, and if the posts are permanently lost I will attempt to reconstruct them. This is most frustrating, and I suspect the problem is a result of a recent upgrade TypePad has made to its software. I have still to receive a response from them about this problem. 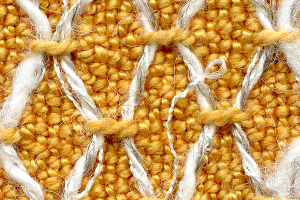 And now on to the subject of weaving. Karl, like many little boys, is in pirate mode. He has a pirate hat, pirate vest, several wooden pirate swords, a whole fleet of toy pirate ships, and a cat named Jolly Roger (the sweetest-tempered cat I have ever met, incidentally). Karl draws endless renditions of pirate vessels, with wonderfully detailed crew. He recently gave me one of these, and I scanned it and adapted it for weaving on my TC-1, in a lampas structure. The only change I made was the addition of a second color in the sails, hull, and ocean waves. Here it is on the loom, two thirds finished. My friend Trinette engaged in a massive project with kudzu on her North Carolina property around 20 years ago. She harvested, processed, retted, and otherwise messed with huge amounts of the pest, and eventually had accumulated enough fiber with which to weave (weft only) a vest. The vest was sold at auction. I don't know who bought it, but the new owner must have been interested in shock value, not comfort, as it was a very scratchy garment. 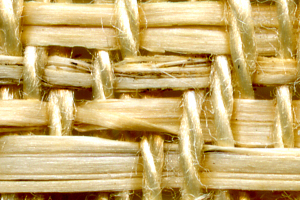 Trinette kindly gave me enough kudzu fiber to weave my own small sample, which you may see here lifesize and at 25x. 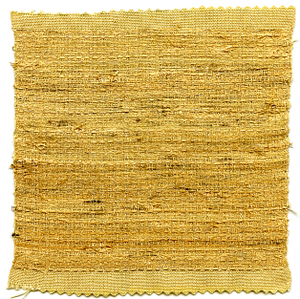 The warp was 20/2 cotton, natural, and the weft full-length pieces of kudzu fiber, knotted together to make them long enough to wind on a shuttle (the usable fiber in the kudzu plant comes from the stem, just as with linen). I don't know if further processing would have made the kudzu spinnable, but in the state it came to me it was just like straw. Anyone out there have any experiences processing, spinning, and/or weaving kudzu? I found a draft for deflected weft in an old weaving book (sorry, source forgotten) and turned the draft so that it could be woven with the fancy yarns in the warp, and one shuttle (always a good thing, in my opinion). Any fancy yarn could be featured and highlighted this way. The fancy yarn in this case is a thick-and-thin cotton/linen/rayon blend with lots of eyelashes. In the draft you will see that the highlighted yarns are threaded on shaft two, and the warp is wound 5 ends plain, 1 end fancy, repeat. After the fabric is released from tension and wet finished, the fancy yarns meander delightfully, even though in the draft they look like straight lines. Now - curiouser and curiouser, cried Alice - TypePad is still behaving very strangely, and I hope that they get it together soon. It appears that the post I published yesterday, May 22 (the one about the pirate ship) came out with the date of May 25. We are now truly in Wonderland.